In a strange twist of fate, this year’s holiday model of the White House crafted from gingerbread and white chocolate, echoes the reality of the U.S. President Obama. As of today, the President is there alone in the beautifully decorated White House (except for the family dog Bo) waiting for conservative members of the House of Representative to address the much desired payroll tax cut. Perhaps the beauty of this year’s amazing gingerbread White House, created by the Executive Pastry Chef Bill Yosses with the thoughtful guidance of First Lady Michelle Obama, will offer him some additional holiday cheer. Working from the original architectural drawing for the White House, Chef Yosses has created yet another stunning holiday masterpiece – this time weighing over 400 pounds! Gingerbread house construction bgean in late September when sheets of gingerbread were baked using the traditional gingerbread recipe long used by the White House kitchen (see recipe below). This allowed ample time for the gingerbread sheets to harden before they were cut into wall and floor panels ready for assembling. With Assistant Pastry Chef Susie Morrison acting as a supervising construction contractor in the famed China Room, where the various presidential china collections are displayed, the model began to take form. When finally completed this year’s culinary wonder was displayed on a marble-topped console table in the State Dining Room. At the suggestion of First Lady Michelle Obama, the 2011 replica included chocolate models of the White House culinary garden complete with beehives and sheltered vegetables rows. Their thoughtful display was a wonderful way to say yet once again that healthy eating should be something all American shoould focus on each and enjoy every day. And, of course, Bo the beloved pet of the First Family was present in the display bigger than ever. Made with ample royal icing, his addition to the scene surely brought a smile to the over 85,000 pre-Christmas Day White House visitors. Now that’s a full house any hotel would envy! Yet come Christmas Day, it’s currently unclear if the President of the United States will be joining his wife and daughters in Hawaii as he waits in Washington DC for the conservative Republicans of the House to address the nation’s urgent needs. "Business! Mankind was my business. We in the hospitality industry craft, not with laws and legistation, but in sugar and with cuisine and service, but these are only a means of expression. The true meaning of our profession hinges on the quality of our choices, the depth of values that we choose to express though our everyday actions. That said, may we all, like the newly enlightened Scrooge, keep that spirit of compassion within our hearts all year long as we serve and create! 1. Cream butter and sugar in an electric mixer for a minimum 5 minutes. 2. Add eggs one by one, then molasses. 3. Put mixer on slow, sift spices, salt, baking powder and baking soda with flour then add these dry ingredients in three increments and scrape bowl each time. 4. Add zests and mix until incorporated, but do not over mix. 5. Remove dough from bowl and place on plastic wrap and spread to 1" thickness over wrap and cover with another sheet of plastic wrap. Refrigerate overnight. 6. Remove dough from refrigerator and roll out a small piece on a floured surface. This dough is very wet, so add flour when necessary to prevent sticking and turn over often. 7. Roll out to 1/8 to ¼ inch thickness for cookies. Cut out Gingerbread shapes. 8. Bake for 12 minutes at 350°F for cookies; 25 minutes or more for ornaments or gingerbread houses. Mix with paddle attachment on electric blender (or by hand) for 5 minutes. If icing is too thick, add more lemon juice or a little egg white to desired consistency. Post Note, 12/23/2011: Perhaps the conservative Republicans of the U.S. House of Representatives have heard the ghosts of Christmas past, present and future as they have finally agreed to pass the expension of the payroll tax cut. With additional dollars to spend millions of people will enjoy the Holidays much more in warmer homes and many welcoming restaurants. And so perhaps now we can all return to the true meaning of these final winter days, expressed so well in the closing words of Dickens' beloved A Christmas Carol. 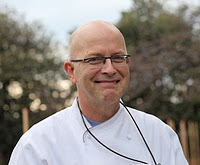 Posted on December 22, 2011 by Ana Kinkaid and filed under Architecture, Chefs, Chocolate, Christmas, Creativity, Cuisine, Design, Hospitality Industry, Leadership, Professionalism, Recipes, Sustainablity, Values, White House and tagged A Christmas Carol Assistant Pastry Chef Susie Morrison Bo the White House Dog Charles Dickens' White House Garden Executive pastry Chef Bill Yosses Michelle Obama Payroll Tax Cut President Obama White House Gingerbread House s.